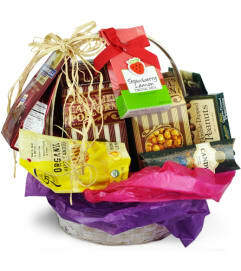 Brighten holiday spirits with this adorable Christmas-y floral gift that's right for any kind of holiday cheer, from a corporate "Thank You," to a snazzy hostess gift, to "Thinking of you this holiday season." Red and peppermint mini carnations, white tulips, and wintry cedar and noble fir pop from a cheery ceramic Christmas tree vase. 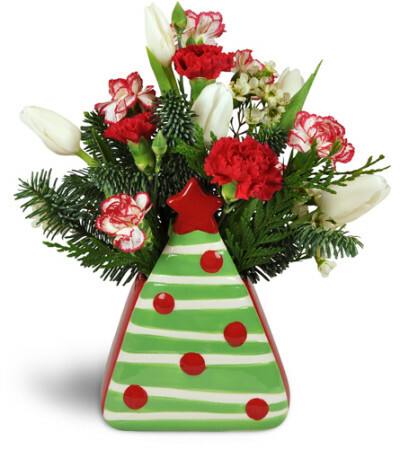 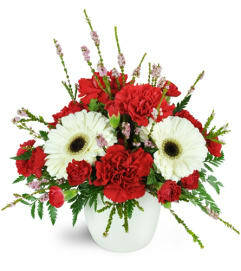 A combination of red and red-and-white peppermint mini carnations, white tulips, cedar, and noble fir are arranged in a brightly painted ceramic Christmas tree-shaped vase.